Distribution and habitat: Rhapis excelsa is probably native to southern China and Taiwan. These palms are not found in the wild; all known Rhapis excelsa varieties come from cultivated groups. More than 100 named cultivars are available, most of then with Asian names. 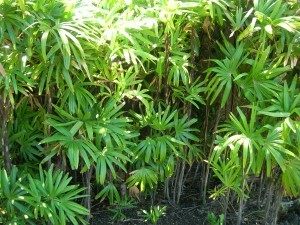 Description: Rhapis excelsa is unlikely to grow indoors more than 1.2m (4 feet) tall. It grows in multi-stemmed clumps with glossy, palmate leaves. The thin stems of Rhapis excelsa can reach 25cm (10 inch) in height and up to 2cm (0.8 inch) thick forming clusters of foliage. These stems are wrapped with mats of brown fiber. As the lower leaves fall off, they leave scars on the stems, creating an attractive bamboo-like appearance. New foliage emerges from a fibrous sheath which remains attached to the base. Fronds grow in a fan pattern and are held erect on 30 to 45cm (12-18 inch) stems, each frond consisting of deeply veined leaflets. Each leaflet is composed of five to eight blunt-tipped, tooth edged segments 22cm (8.5 inch) or so long and up to 5cm (2 inch) wide. This palm is usually dioecious which produces a small inflorescence at the top of the plant with spirally-arranged, fleshy flowers containing three petals fused at the base. Ripe fruit are fleshy and white. Houseplant care: Its ability to handle low light intensities, low humidity, varying temperatures plus its suitability to container planting, small to moderate size and slow growth rate make Rhapis excelsa ideal indoor plant. Trim off lower leaves as they age and become discolored. Light: Grow these plants in bright filtered light. During the winter months, however, provide them with three to four hours of direct sunlight each day. Temperature: Rhapis excelsa will do well not only in normal room temperatures, but also in cool conditions down to about 8°C (46°F). Under the cooler conditions they simply take a winter rest or grow more slowly. Water: Water actively growing plants moderately, giving enough at each watering to make the potting mixture moist throughout, but allowing the top centimetre (0.4 inch) or so of the mixture to dry out before watering again. During the rest period, if applicable, water more sparingly, allowing the top 5cm (2 inch) to dry out between waterings. Fertilising: Apply standard liquid fertiliser about once a month to actively growing Rhapis excelsa. Potting and repotting: Use a soil based potting mixture. Do not move these palms into larger pots more often than once in two years. Grow them in pots that look a little too small for them. After reaching the maximum convenient pot size (probably about 30cm (12 inch)), give the plants a top-dressing with fresh potting mixture every spring. Propagation: Rhapis excelsa produce suckers from the base of the plant and these can be used for propagation in spring. Cut off a basal sucker preferably one with some roots already attached to it and plant it in an 8-13cm (3-5 inch) pot size of the recommended potting mixture for these palms. Place the pot in a warm position in medium light and water the sucker sparingly. Give it just enough at each watering to make the entire mixture barely moist and allow the top centimeter (0.4 inch) or so of the potting mixture to dry out before watering again. As soon as new growth becomes apparent, the young palm can be treated as mature. These palms can also be propagated from seed, but it takes a great deal of time. The propagation through suckers is both quicker and surer, especially for the amateur gardener. Gardening: Rhapis excelsa can be used for a tropical garden landscape. This palm is adaptable to soil types, although neutral to slightly acid soils with good drainage and organic matter is recommended for best results. 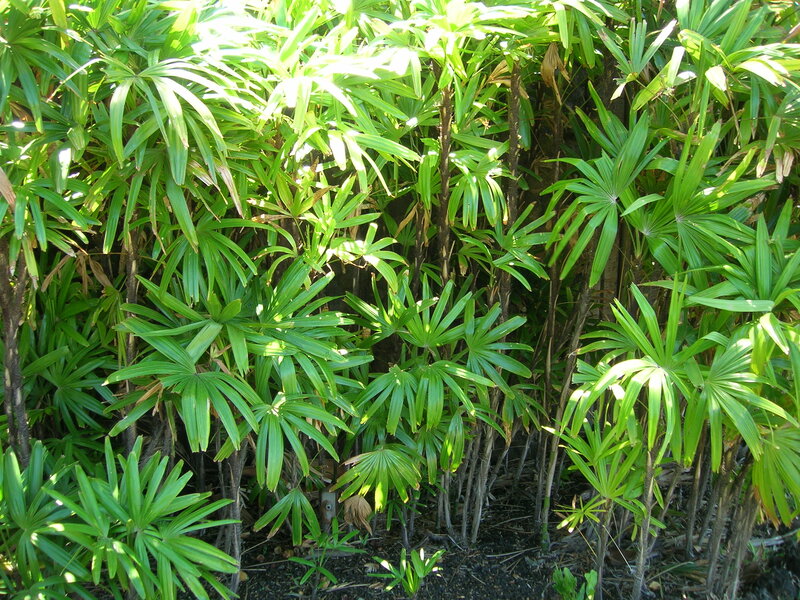 Choose a partially shaded spot under trees or a pergola to place the Rhapis excelsa. It can be grown in full sun as long as the soil have good moisture-retentive properties and the palm receive plenty of water. The leaves, however, will lose their deep green colouring when exposed to full sunlight, becoming yellowish green and on the hotter days will probably burn. Temperatures as low as -5°C (23°F) are tolerated by Rhapis excelsa as it is quite cold hardy, particularly when grown under shelter. It also grows in climates where it may be exposed to prolonged periods of cold weather. Very hot weather, particularly when the air is very dry, may cause damage which can be prevented by adequate watering, mulching and growing under other plants or pergolas. Occasional hosing of foliage with a fine spray or mist can also help to maintain a higher relative humidity. When grown outdoors these palm can rich to a maximum height of between 3-4m (10-13 feet), each stem or cane is slender ranging from 1-3cm (0.4-1.2 inch) in diameter. Problems: Rhapis excelsa has very few pests or diseases to trouble it. The only major pests are scale and mealybug. Treatment: Scale can be easily controlled by physical removal, wash off with high pressure jet of water or scrape off with cotton wool buds or by chemical control with appropriate insecticide. Mealybug can be removed physically but it usually requires chemical control. For total control use a suitable insecticide and apply it as a soil drench as mealybug often invades the roots of a plant. Root rots can be avoided through proper cultural practices such as choosing healthy plants in the first place and watering only when necessary. Provide good drainage so that water does not build up and stay around the roots of the palms. But if, despite great care, root rot symptoms do develop, such as wilting, excessive browning of leaf tips and loss of vigour, can be caused by root fungus. Treatment: Firstly remove the plant from the soil it is in, wash roots bare of soil, inspect roots for fungus problems, remove black roots or reddish brown roots and replant into a raised bed of well drained soils. In the case of potted plants do the same but plant into a clean well drained potting mix and, finally, drench the soil with a systemic fungicide. Brown or black fungal spot is usually caused by poor cultural practices. Treatment: To prevent the disease, buy only good quality plants and do not crowd plants too much so as to allow unimpeded air flow to reduce conditions ideal for the fungus. If leaf spot does occur remove and burn the affected leaves. Thin out plants or space potted plants to improve ventilation and finally spray all affected plants with a preventative fungicide. Brown leaftips are often caused by an excessive accumulation of fertiliser salts in the potting mix. Treatment: Thorough leaching will overcome this problem. Soak the palm roots in water for a couple of hours to leach out accumulated salts, toxins and to carry oxygen to the roots. Refer to Fertilising section to prevent further fertilising excess. Rhapis excelsa Zuikonishiki has yellow markings on each of the segments and is rarely any taller than 60cm (24 inch). Rhapis excelsa Koban is a popular cultivar with dark-green leaves. Rhapis excelsa Gyokuhu is a dwarf variety. It slowly adds only a 5cm (2 inch) of height per year and produces numerous offshoots. This variety may only grow 1.2m (4 feet) of height after 30 or 40 years of age in outdoor plantation. Nicknamed the “bush baby”, this variety is excellent for collectors of dwarf specimens, bonsai gardens, or areas requiring small, very special ornamental palms. Rhapis excelsa Kodaruma is the smallest variety of Rhapis excelsa. This slow grower puts lots of energy into producing pups, so it grows out more than up. Small leaves on miniature canes personifies the word dwarf. This is another variety excellent for collectors of dwarf specimens, bonsai gardens, or areas requiring small, very special ornamental palms. Notes: May be confused with Serenoa repens or Licuala grandis, but both these palmate leaved species have spines on the petiole, unlike Rhapis excelsa which is unarmed. Uses: Its low light and humidity requirements, dust, and drought tolerant make Rhapis excelsa a common feature in malls and offices. This dwarf palm is commonly used as screen, border, mass planting, specimen plant, container or above-ground planter, naturalizing or accent plant. They lend a rich tropical look to the landscape. Lady palms can be effective accents in a shrub border or near an entryway. Plant on 0.9 to 1.2m (3- 4 feet) centers to create a mass effect. Locate them in a low-growing ground cover such as Ophiopogon japonicus (Mondo Grass) or Liriope muscari (lily Turf) for a dramatic effect. This palm looks wonderful when it is lighted from below or silhouetted at night. This exotic palm is one of the best plants for improving air quality indoors. It has one of the top removal rates of toxins such as formaldehyde and ammonia.